Tech. Sgt. Jeff Barna, left, and Staff Sgt., Jovann Stone both of the 127th Communications Flight, Michigan Air National Guard, Selfridge,MI terminates base fiber optics at Volk Field Air National Guard Base, Wisc. July 6, 2016. Happy 241st Birthday U.S. Army Chaplain Corps! Always providing spiritual support to our Soldiers & their families. The U.S. Army Chaplain Corps is one of the oldest and smallest branches of the Army. The Chaplain Corps dates back to July 29, 1775, when the Continental Congress authorized one chaplain for each regiment of the Continental Army. 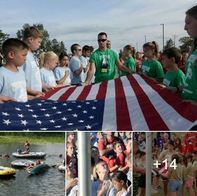 The National Guard Youth Leadership Camp is for youngsters, 9-12 years old, who are dependents of active and retired Michigan National Guard members and Department of Military & Veterans Affairs employees. The camp is designed to provide a positive experience through leadership classes, individual confidence and positive self-esteem building, as well as team-building activities. Trailblazers and coaches participate in activities such as flag ceremonies, swimming, laser tag, paintball, arts and crafts, map and compass training and a wide variety of outdoor fun. 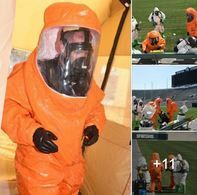 The camp is held annually at the Alpena Combat Readiness Training Center. The Michigan National Guard released unique Climate Preparedness and Resilience plans today in Lansing. The plans encompass the Camp Grayling Joint Maneuver Training Center in Grayling, the Fort Custer Training Center in Augusta, and Selfridge Air National Guard Base in Mount Clemens. Funding for the comprehensive plans project was provided by the Office of the Assistant Secretary of the Army (Installations, Energy and Environment) following a 2013 Presidential Executive Order that included a goal work with stakeholders at the state, local, private-sector and non-profit-sector levels in an effort to improve overall climate preparedness and resilience. 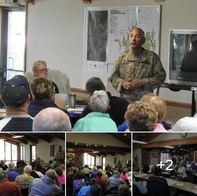 Leaders from the Michigan National Guard briefed members of the Lake Margrethe Property Owners Association on what to expect during this year's Northern Strike exercise. 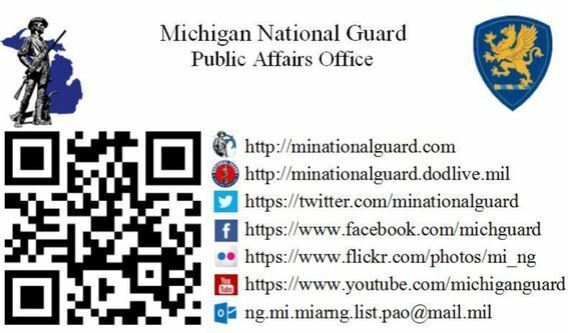 The Michigan National Guard makes great efforts to be as courteous and forthcoming as possible to our community partners as we greatly appreciate the support they provide. The Michigan National Guard began road repair operations Sunday in Michigan’s Upper Peninsula, following severe rain that caused numerous washouts. Approximately 40 Soldiers were activated in response to the emergency declaration issued by Governor Snyder Friday. The Soldiers are from armories in Kingsford, Iron River and Gladstone. All the Soldiers are members of 107th Engineer Battalion headquartered in Marquette. Students from Wayne State University's Aviation Career Education Academy take a photo with members of the 127th Wing and an A-10 Thunderbolt II aircraft at Selfridge Air National Guard Base, Mich., during a tour at the base to learn about job opportuities in Michigan's hometown Air Force. The ceremony is a combination of two special traditions. First, following a long-standing, honored United States Presidential Tradition, on the birthday of each deceased president, the incumbent president sends a tribute wreath to be reverently placed by a military officer at the deceased president’s tomb. The second tradition is of a more personal nature. 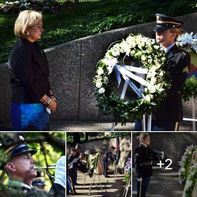 Established by Mrs. Betty Ford in honor of her husband, she issued an instruction that outlined special people and organizations that held significant meaning to President Ford should be included in the wreath-laying ceremony. She felt it was important to include military members, law enforcement, the Boy Scouts, and other organizations who were important parts of the president’s life. The Michigan Air National Guard’s 127th Wing has been named the top flying unit in the Air National Guard. The National Guard Association of the United States (NGAUS) has awarded the Wing the Carl A. Spaatz Award, which is presented annually to the overall outstanding flying unit in the ANG. The award, which covers calendar year 2015, recognizes the significant combat operations of the 127th Wing in 2015, the unit’s unprecedented success on a major operational inspection and the Wing’s ongoing partnership with international, national, state and local partners. 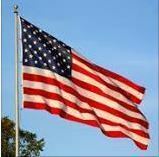 When displaying the U.S. flag at half-staff, it should be raised to the peak for a few moments then lowered to the mid-way point on the staff. At the end of the day the flag should be raised from half-staff to the peak of the staff then lowered slowly from that point. The U.S. Flag document and www.usflag.org/flag.etiquette.html both offer additional information. Air Force Lt. Gen. Joseph Lengyel was confirmed as the 28th chief of the National Guard Bureau by the U.S. Senate. The Soldiers of the Latvian National Armed Forces and the Airmen from the Michigan Air National Guard’s 127th Civil Engineer Squadron are working together on a Humanitarian-Civic Assistance project supported by several organizations. For the Latvians and the Michiganders, the project is the latest in a long-line of cooperative efforts begun when the nation on the Baltic Sea and the state on the Great Lakes became aligned in the State Partnership for Peace program in 1993. 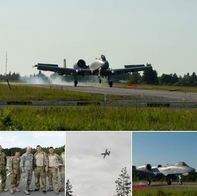 Michigan National Guard A-10 Thunderbolt jet aircraft practiced highway landings as part of Saber Strike, a long-standing U.S. Army Europe-led cooperative training exercise to improve joint interoperability through a range of missions that prepare the 14 participating nations to support multinational contingency operations. The National Guard builds partnerships. Happy Fourth of July! 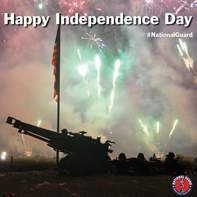 As we celebrate our freedom today, we also thank those who defend it. Latvian joint terminal attack controllers and joint fires observer perform tactical movements for a close air support training mission with C Company, 125th Infantry Regiment, Wyoming, Mich., July 28, 2015 at Grayling Air Gunnery Range at Northern Strike 15. NS 15 is an annual training exercise on CGJMTC that assesses joint air-to-ground capability and involves hundreds of military personnel from twenty different states as well as Canada, Latvia, Poland and Australia. Lt. Col. (Ret.) Charles Kettles recounts the event of May 15, 1967 during a press conference June 23 held at the Ypsilanti Armory in Michigan. After his account, he briefly answers questions from local reporters. 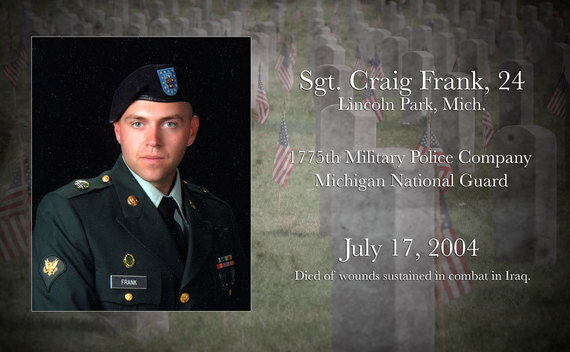 He will be awarded the Medal of Honor July 18 at the White House. Thank you Representative Candice Miller for your dedicated support with the Michigan National Guard. The Michigan Army National Guard is proud to announce the promotion of Amanda Falor to the rank of major, July 14, 2016. 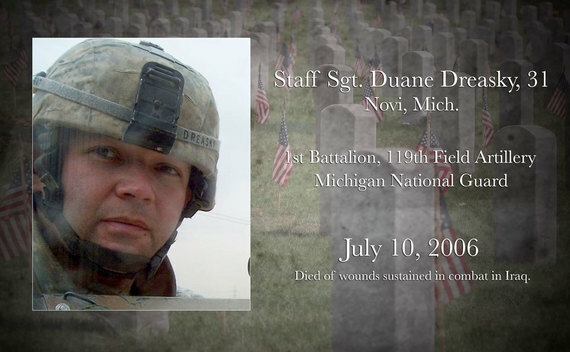 Falor, of Dewitt, was joined by her husband Capt. Todd Falor, a MIARNG strategic plans officer, her children, many family members, friends and distinguished guests, for a pinning ceremony held last Friday at the Michigan National Guard Joint Forces Headquarters installation in Lansing. 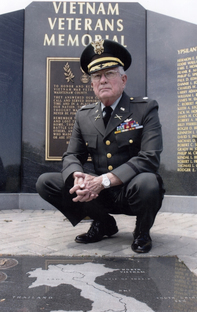 Congratulations to Ypsilanti native Lt. Col. Charles Kettles (retired) who is being presented the Medal Of Honor today by President Obama at a ceremony in Washington, DC. 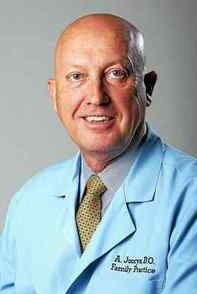 Algirdas (Al) Juocys, D.O., chief medical officer and co-founder of MedNetOne Health Solutions, recently received the military Legion of Merit award for 35 years of medical service in the Michigan National Guard. 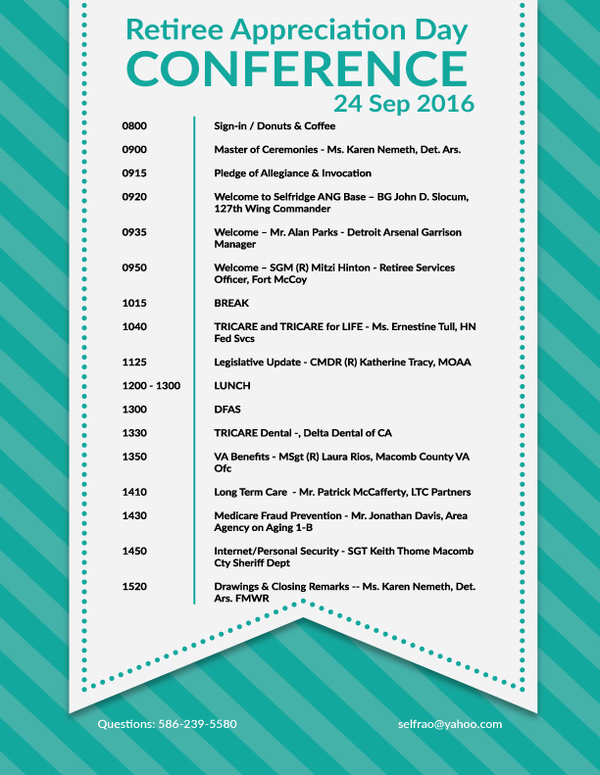 Officials at the healthcare management organization made the announcement. The Legion of Merit is a prestigious military award, ranking just below the Silver Star. Dr. Juocys is a retired decorated state surgeon of the Army National Guard, where he achieved the rank of colonel and served two tours of duty in Iraq in 2004 and 2006.